The bedroom is a space that visitors and guests aren’t going to see very frequently, so if you have toned down your decorating in the rest of your house, your bedroom can be a true reflection of your personality. The key to an effective traditional bedroom design is the balance between living space and storage. The most important pieces of furniture are going to be your bed and mattress, closely followed by wardrobes, chests of drawers, dressing tables and other bedroom storage furniture – if you aren’t lucky enough to have a dedicated dressing room. You also shouldn’t overlook wall and floor coverings, as these will be essential to creating the look that you want. 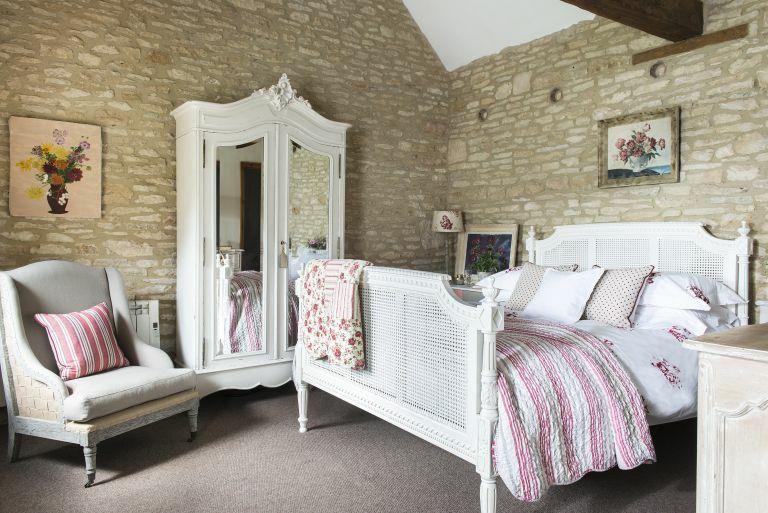 Want to be able to visualise what a beautiful traditional bedroom looks like? Have a look at our gallery of traditional bedroom design ideas. Choosing a wallpaper design will instantly introduce a warmer, more traditional feel to your bedroom, and create an opportunity to add pattern and texture, important in a room with few period details remaining. While you might avoid hanging wallpaper on all four walls when designing a living room, this is an approach that won't look out of place in a bedroom; if anything, wallpapering all four walls will make the room feel cosier and more intimate. Failing that, putting wallpaper behind the head of a statement bed or headboard will draw still more attention to it. For a period look, look for a wallpaper with an intricate design in muted colours; pick a wallpaper with a botanical theme for a William Morris effect, or a graphic design for a more versatile look. What to be aware of when picking out a wallpaper? Super-sized prints in bold colours will overwhelm a small bedroom, while small prints look more traditional and tend to suit smaller spaces or country cottage bedrooms. Want to make the bedroom feel larger? A subtle, vertical stripe will make the ceiling seem higher; horizontal stripes will make the room feel wider. To create a feature wall pick a vibrant pattern for one or two of the most visible walls and then paint the remaining walls a subtler, but still complementary, colour. What effect do you want your wall colour to create? Choosing bedrom paint colour carefully will ensure that you bring more natural light into the room; or, opting for lighter colours, that it feels larger; perhaps, since you only use your bedroom in the evening, you'd rather it felt cosy and intimate with darker colours? Overall, your colour scheme should promote rest and relaxation, rather than overstimulating you before bedtime. The best bedroom paint colour schemes might also play to your property's heritage if you choose an authentic period paint colour. To achieve an elegant, traditional look don't shy away from darker and bolder paint colours, or consider just painting one wall to make a statement. Greys are an ever-popular choice for bedrooms of all styles and sizes, but you can also try a deep forest green. Small bedroom? Find lots more design ideas for a small bedroom. If you are blessed with a larger bedroom, you can be more adventurous with colour: try experimenting with a darker decorating palette, add a striking feature wall or get creative with bold paint colours. Bear in mind, too, that the natural light your bedroom receives should affect your colour choice. North- and east-facing bedrooms get colder light but plenty of sun in the morning, so more muted shades of all colours will stop the room feeling too bright; equally, south- and west-facing rooms will get lots of sunlight in the evening, so you may want to choose cooler colours to keep them feeling restful. Once you've chosen your main room colour, pick out one main accent and another one or two accent shades to use in smaller doses. This gives you the opportunity to add warmth to a neutral scheme or cool down a bright scheme. Then, design bedroom lighting in a way that will complement your colour scheme. A bedside light is a must, but darker rooms will benefit from wall lighting and/or a ceiling light. Period homes may have windows that need updating, leaving your bedroom particularly exposed to the elements, so you may want to invest in substantial window treatments to keep the bedroom feeling cosy on cold nights. Heavy bedroom curtains are a classic choice, but choose black-out curtains if you're light-sensitive in the mornings. Or, layer up to cut out the daylight and add to the feeling of luxury by matching curtains with with Roman blinds or shutters, the latter being great at helping keep your room feel private while still allowing in light. Window dressings are all-important for adding pattern and colour, too. Shutters can be colour-matched to your scheme. Or, you can choose a pattern for your curtains and blinds to draw attention to a large window. The patterns needn't match, but they will work best if they tone. Just as with wallpaper, you can create visual tricks with fabrics: vertical stripes will exaggerate a window's height; horizontal stripes its width. Trying this trick at the windows? Keep the walls pattern-free. Ensure curtains are hung clear of the window frames when pulled back and that blinds can be pulled as far up as possible to make the bedroom window feel as large as it can and to let in lots of light. The main consideration for your bedroom flooring is comfort. No one wants to swing their legs out of bed and find themselves barefoot on cold flooring. For this reason, carpet is still a popular choice for bedroom flooring. Solid wood is equally popular, as it can still be warm underfoot, as is laminate and vinyl, that can now replicate the appearance of wood. Underfloor heating is becoming increasingly popular on the upper levels of homes, so don’t rule out the possibility of tiles or real stone in your bedroom. Find out more abou choosing bedroom flooring. The first question you should ask yourself when choosing your bed is where you are going to place it? Think about hotel rooms and you will notice that, largely, they all follow the same design. The bed is placed in the centre of the longest wall. Placing the bed against this wall usually generates the most floor space, while also promoting good flow and space between the bed and any storage in the room. Headboards are an important feature in traditional bedrooms; they create a visual focal point, especially effective in bedrooms with a centrally positioned bed. A padded and upholstered headboard will also enhance comfort – particularly if you like sitting up in bed. How big a bed should you buy? That is down to your own tastes and needs. Some people like the bed to dominate the space, while others want extra floor space and room for bedroom furniture, such as chairs and sofas, which will add to the feeling of comfort in a traditional bedroom. Your only concern should be, can you open any drawers and wardrobe doors comfortably, and also move through the room without having to dodge furniture? Find out how to choose the best bedroom furniture in our guide. What you want in your bedroom dictates the type of bedroom storage you need, whether it's fitted units or freestanding units. Think beyond clothing storage, too. Do you have a book collection that you want on display, or a dressing table with a mirror that you need to make space for? Perhaps you need storage for jewellery, or makeup storage. You will definitely need to assess how much clothing you have and factor that into the width of your wardrobes and how many drawers you need. Master bedrooms usually have a chimney breast running up one wall and the indented alcoves are often ideal for slotting in storage. As with other furniture, think how your bedroom storage will harmonise with the look of your bedroom, especially any period details you may have. We have tons more bedroom storage solutions for you to consider. Fitted storage units are a great solution for period properties, because any good designer or joiner will be able to craft bespoke units for awkward spaces. You should expect to pay from £2,000 up to £15,000 for a whole bedroom, depending on the size and the complexity of the work. The downside to a fitted bedroom is that the units are fixed, so if you change your mind, removing them or changing the units will be costly. Freestanding storage is often considerably cheaper than its fitted counterpart. A standard oak wardrobe, usually just wider than a metre, costs from £250 to well over £1,000 from a highstreet furniture shop. You can expect to pay a lot more than that for antique examples, or far less if you don’t mind searching around the vintage fairs and antique shops. A chest of standard 1x1m drawers is a similar story. Expect to pay north of £150 for a basic unit, up to £1,000 for something more substantial. Antique drawers can be incredibly elaborate and have a price tag to match, so if you want something really special, you can spend in excess of £3,000 for the perfect piece. You can also upcycle vintage furniture – find out how to paint furniture and create a colour statement with your wardrobe or chest of drawers. If you’ve got the space in your house to create a separate dressing room next to your traditional bedroom, then perfect. This room may have once been a big cupboard, an unused bathroom, or a child's bedroom that has been grown out of and all you will need to do is knock through and fill it with storage. If you don’t have a separate room to convert into a dressing room, it is possible and cost effective to create a dressing room by adding in a partition stud wall. Hiring a contractor will cost around £15 per m2, but it is a job that you can do yourself by following a few simple steps. Your main concern if you do the job yourself is to make sure any storage and furniture you wish to use in there will actually fit. Freestanding clothing rails are a popular choice because they are easy to install, all of your clothes are visible, and there are no doors or drawers taking up valuable space. You also need to make sure you have left enough of a doorway for you to move into the space.